SALT LAKE CITY, USA -- The new U.S. ambassador to Russia says restoring Ukrainian sovereignty over all its territory will be a key issue in his dealings with Moscow as he begins his tenure amid a period of high tensions between the two world powers. Russian President Vladimir Putin (right) and the new U.S. ambassador to Russia, Jon Huntsman, after receiving his diplomatic credentials during a ceremony at the Kremlin in Moscow on October 3. 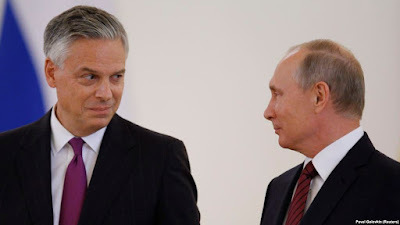 Speaking in Salt Lake City, former Utah Governor Jon Huntsman on October 7 said he wants to improve relations with Russia, but he insisted the first step would be for Moscow to return Ukrainian control to territory within its internationally recognized borders. "This is an issue not only with the United States, but with Europe, Canada, and virtually every other developed country," said Huntsman, who was visiting his home state for a ceremonial swearing-in event. Moscow seized the Crimean Peninsula from Kiev's control and has supported separatists in eastern Ukraine in war that has killed more than 11,000 people since 2014. The United States, other Western countries, and the European Union have imposed sanctions on Russia for its actions in Ukraine, just one of many global issues separating the two countries. Huntsman, who presented his credentials to Russian President Vladimir Putin at the Kremlin on October 3, told the Salt Lake City crowd that he wants to work with Moscow to solve the crisis over North Korea’s banned nuclear and ballistic-missile programs. He called Pyongyang a threat to Russia and the rest of the world, not just to the United States. "Acting together, we think the United States and Russia could force the North Korean regime to the negotiating table to find a diplomatic solution," he said. Huntsman also spoke of possible cooperation with Russia in the effort to defeat the Islamic State (IS) militant group and in efforts to end the six-year civil war in Syria, where Washington and Moscow back opposing sides. The severe tension in bilateral ties also stems from a January report by the U.S. intelligence community that determined Putin ordered an "influence campaign" targeting the 2016 presidential election in the United States. At a confirmation hearing before a Senate panel on September 19, Huntsman said there is "no question -- underline, no question -- that the Russian government interfered in the U.S. election last year. And Moscow continues to meddle in the democratic processes of our friends and allies." Huntsman served as U.S. ambassador to Singapore under President George H.W. Bush and as ambassador to China under President Barack Obama. He briefly ran for the Republican presidential nomination in 2012.